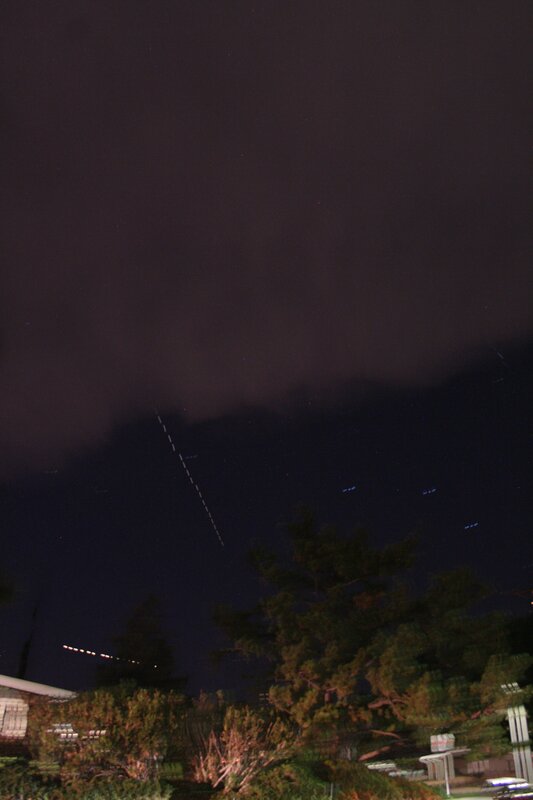 I hope that some of you in LA got to see the nice ISS pass that I talked about last night. It was bright, it was long, it went almost from horizon to horizon, fairly near the zenith. But the green stuff hadn’t covered the blue dot yet, so hope springs infernal! Out I went with my tripod & gear! Much as in the radar, clouds covered most of the sky. But not ALL of it – there was that little slice to the west-northwest where the ISS would be rising. And the lighting wasn’t continuous, nor was it close enough to actually hear the thunder yet, so standing out there in the open on top of the hill next to the trees and telephone poles wasn’t the stupidest thing I had done today! I tried shooting this in portrait mode this time instead of landscape mode since the ISS was rising pretty much straight up. That part worked. I even remembered to focus! I still need to work on getting a slightly more stable tripod setup, since you can see where there was a slight shift twice. But given the circumstances, I’m not unhappy with this result. I’ve seen (and photographed, for better or for worse) the ISS three times in two days. (No visible pass tomorrow, but there’s a so-so one on Sunday night, then nothing for a while.) And I didn’t get hit by lightning! 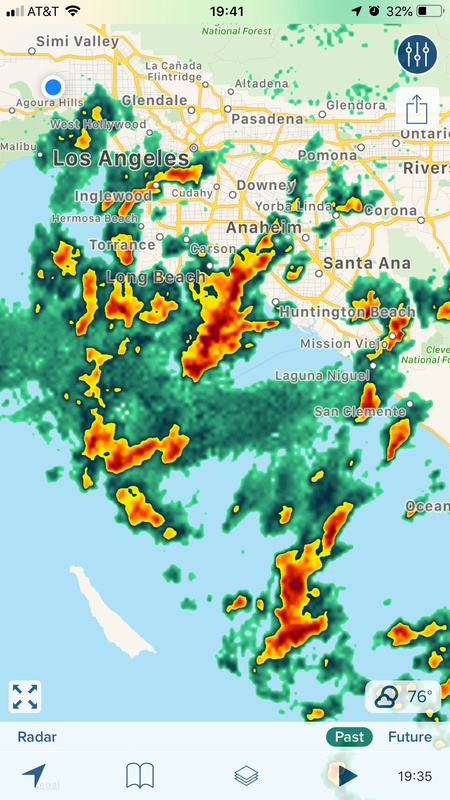 Now it sounds like the storm is here and that big orangish, reddish, angry looking blob is headed right towards us in the next fifteen to twenty minutes, so I’m going to go out on my front porch and enjoy (in safety) a bit of rogue Southern California weather. I might even do another Facebook Live if it gets to hopping and booming!